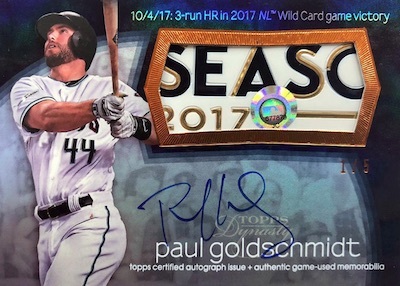 Low print runs and on-card signatures (or cuts) continue to drive the one-card-per-box 2018 Topps Dynasty Baseball. Matching the 2017 set, every card is numbered to 10 copies or less. All options have an added relic piece except for the main cut signature cards. The cards come encased, even the redemptions. 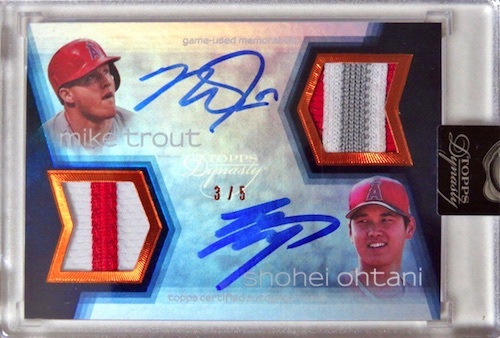 While there is not really a base autograph in the 2018 Topps Dynasty Baseball checklist, the hard-signed Dynasty Autographed Patches line is the primary offering. The main version is numbered to 10 copies, with added parallels featuring five copies as well as a one-of-one version. 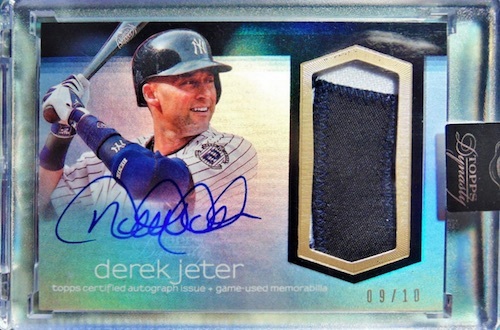 The On This Day Autographed Patches (#/5) set returns to celebrate more big-time performances from top players. There are also the one-of-one Dynasty Autographed MLB Logo Patch cards. Doubling up the memorabilia pieces in 2018 Topps Dynasty Baseball, the Dynasty Autographed Dual cards come in both Relic and Patch versions. Both are numbered to five copies with a one-of-one parallel. New in 2018, the Dynasty Autographed Special Event Baseball Leather (#/5) cards highlight game- or event-used baseballs from "MLB special event days." The solicitation shows a 2017 ALCS ball for Jose Altuve. Although most of the 2018 Topps Dynasty Baseball cards feature on-card autographs, another possibility is a cut signature. These all-time great subjects are only found in this portion of the checklist. Choices include Dynasty Cut Signatures (1/1) and Dynasty Dual Relic Cut Signatures (1/1). Adrian Beltre 2018 Topps Dynasty 4 Color Game Used Patch Auto 10!!! Buy 2018 Dynasty MLB boxes direct from Topps for $324.99. 85 subjects. Serial numbered #/10. Shop 2018 Topps Dynasty MLB cards on eBay. PARALLEL CARDS: Blue #/5, Gold 1/1. 23 cards. Serial numbered 1/1. 27 cards. Serial numbered #/5. 9 cards. Serial numbered #/5. 90 cards. Serial numbered 1/1. LOS PRODUCTOS SON DE BUENAS CALIDAD. At this price redemptions should not be in here. Not complaining about the price or the product. Good looking low #’d cards. But for $350 I shouldn’t open a box with anticipation just to see an encased redemption card that may take 10 months to get to me. Never again will I buy this product. Not a single Blue Jay, ridiculous! Cracked one box pudge nothing special worth a 100 box cost 350.